CyborgCamp is back! Last held at MIT Media Lab in 2014, CyborgCamp is returning to Portland, Oregon this November at the Pacific Northwest College of Art! 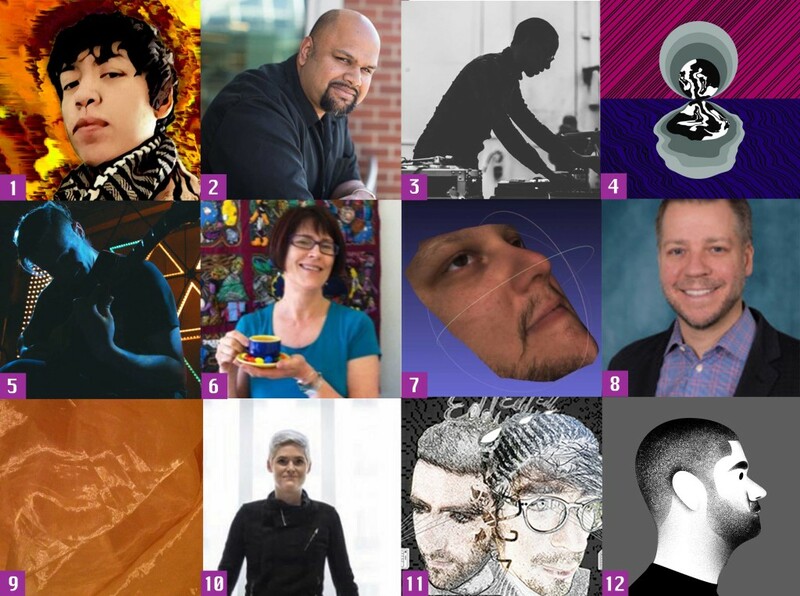 We’d like to thank the 12 local speakers and performers helping bring CyborgCamp to life! On the fence about going? There are still a few tickets left! Can’t go? Consider sponsoring low income attendees by buying a couple of tickets! The cost is only $20, and you’ll be helping someone out! CyborgCamps are small, in-depth unconferences about the future of the relationship between humans and technology. Attendees discuss a variety of topics such as the futures of identity, privacy, surveillance, hardware to wetware, drones, 3D printing, cyberpunk, human augmentation, constructed reality, the second self, ethics, robot rights, sexuality, urban design, and anthropology. Topics are discussed the morning of the conference and scheduled into the conference grid by attendees themselves, making it a DIY conference experience. An unconference is a conference organized by the attendees on the day of the event. Although CyborgCamp will have some morning speeches to kick off the day’s events, most of the day will be made up by talks and breakout sessions organized by attendees. The unconference model allows one to really determine what they’re interested in learning, instead of being tied to a very stringent conference agenda. Each CyborgCamp has its own mix of topics created by what the attendees want to discuss. All CyborgCamps follow a Code of Conduct. CyborgCamps generally have less than 100 attendees, making it easier to have more in depth discussions with people across different fields. The small format increases the chances getting to really know your fellow attendees. Every CyborgCamp welcome people from different backgrounds, including social, business, academic and trade-related. Just as cyborg studies sit at the crossroads of multiple academic disciplines, we like to invite people at the crossroads of different disciplines and boundaries as well. At CyborgCamp, attendees make the conference. Some attendees come prepared with ideas of what they want to talk about, and others come to listen and learn. Some attendees have relevant experience and prepared talks, and others just have a woolly idea needing discussion. At the start of the conference, attendees write their ideas up on a board and the conference begins! Clear your calendar for November 3rd, 2018 and register for CyborgCamp here! The conference will be held at PNCA on Saturday, November 3rd, 2018 from 9am-6pm. On November, 2nd, we’ll have a pre-party with live tech performances, 3D scanning and other treats from 7-10pm at a secret, undisclosed location. Anyone interested in making a post-conference zine is welcome to join the CyborgCamp writing party on Sunday, November 4th! CyborgCamp has always been an affordable conference. We use sponsor funds and a low ticket price to provide meals, entertainment and unconference sessions to everyone who attends. Tickets are $20 to encourage people of multiple backgrounds, especially students. If you’d like to help sponsor the conference, simply buy a bundle of tickets, and we’ll use the funds to provide scholarships to those who can’t afford the ticket price. We’re looking for a handful of sponsors to provide sign language, closed captioning, and other accessibility support for the conference. The best thing about sponsoring? It’s tax deductible! Please contact caseorganic at gmail dot com with any inquiries! You’ll get a small sponsor packet and a non-profit donation instructions! I’m excited to announce that I’ll be hosting two workshops at Portland’s Pacific Northwest College of Art in November 2018! I just joined the school as a faculty researcher, and I’m looking forward to contributing to MAKE+THINK+CODE, a creative technology-focussed lab, institute, and incubator for creative experiments at the intersection of science, technology, design, art, and culture. Calm Technology is a framework for designing ubiquitous devices that engage our attention in an appropriate manner. The aim of Calm Technology is to provide principles that follow the human lifestyle and environment in mind, allowing technology to amplify humanness instead of taking it away. The difference between an annoying technology and one that is helpful is how it engages our attention. This workshop will cover how to use principles of Calm Technology to design the next generation of connected devices. We’ll look at notification styles, compressing information into other senses, and designing for the least amount of cognitive overhead. Students will work in groups to solve a series of design challenges, including designing new products, ‘calming down’ a complex ones, communicating the principles of Calm Technology across an organization and team, and entering a product successfully into the marketplace. Use principles of Calm Technology to design the next generation of connected devices. Use methods of Calm Technology to design technology for generations, not seasons. Enter your product successfully into the marketplace. This workshop is for anyone that actively builds or makes decisions about technology, especially user experience designers, product designers, managers, creative directors, developers and students interested in the future of technology and humanity. Bringing a laptop is not required, as work will be done on paper and in groups. Sound is one of the most commonly overlooked components in product design, even though it’s often the first way people interact with many products. When designers don’t pay enough attention to sound elements, customers are frequently left with annoying and interruptive results. This practical workshop covers several methods that product designers and managers can use to improve everyday interactions through an understanding and application of sound design. If you know of anyone who’d enjoy these workshops, please let them know! These are aimed at user experience designers, students, artists and technologists. You do not have to be affiliated with PNCA to attend. Back in 2010, a colleague and I started working on a project that would later become a startup called Geoloqi, a low power GPS solution that focused on privacy and control over your data. GPS wasn’t even available on iOS or Android devices yet, so we used Boost Mobile phones and Palm devices. When we built our API, we realized that the best way to test it would be to take it on the road – so we did. We brought our API to hackathon after hackathon. We thought that if we could use our technology to build solutions good enough to win hackathon prizes, then we might have something that we could scale. It was during the hackathon process that we learned the most. Even if we didn’t take home a prize, we practiced working together in better ways, and we came up with ideas we wouldn’t have if we didn’t rise to the challenge of time-constrained work. Our favorite hackathons were in the disaster relief space. Open Government, emergency preparedness and civic responsibility organizations were an incredible way of bringing data to life with location. A year later, we were a larger, seed-funded company, and in 2012, we were acquired by mapping giant Esri, a company known for providing governments and citizens with crucial mapping for disaster planning. This is why I was so excited to hear about the Call for Code initiative. This is the kind of hackathon we dreamt of when we worked on our startup. And the prize is $200,000 USD! That would’ve been enough seed funding for a year of our startup (we raised 175K for our first product). 2017 was one of the worst years on record for #naturaldisasters. There a many ways to use technology to better handle response, translation, prediction and management of #weather events to reduce risk, loss, and damage when they happen. The Call for Code Global Initiative is the largest and most ambitious effort to bring startup, academic, and enterprise developers together and inspiring them to solve one of the most pressing societal issues of our time: Preventing, responding to, and recovering from the chaos caused by natural disasters. Who and how can you participate in Call for Code? All developers, designers and entrepreneurs who are over the age of 18 can participate. Developers can register as individuals and submit an application later as part of a team of up to five members. Projects can be entered between June 18, 2018 and August 31, 2018. Thirty semi-finalists will be selected in September. A prominent jury including some of the most iconic technologists in the world will choose the winning solution from three finalists. The winner will be announced in October 2018 during a live-streamed, all-star benefit concert coordinated by the David Clark Cause.Call for Code participants can use IBM Cloud, Watson, Blockchain and IoT technologies, along with open source IBM Code Patterns – curated reusable packages of documentation, architecture diagrams, process flows, and access to underlying code on GitHub – to innovate and build submissions. Click here for more information and register your participation, and contact Anders Quitzau for any further questions! Interruptions are inevitable. Some alerts are helpful and others distract during inopportune moments. How do we design a system that empathizes with its users and adjusts the way it communicates? Last year, Microsoft Design invited me to Redmond, Washington to consult on their accessibility and inclusivity initiatives. Millions of users means hundreds of thousands of edge cases, and mobile products only increase temporary, situational and permanent frustrations. The team was interested in Calm Technology because it offered them a new way to address ongoing issues experienced by existing and future customers. After a number of interviews and workshops about attention and notification fatigue, I worked with Microsoft to help adapt some of Calm Tech principles into their organization and their inclusivity toolkit. The guide introduces a reframing of the concept of disability, how user experience intersects with the goals of inclusivity, and an overview of permanent, temporary and situational exclusions. How do you achieve focus? from Microsoft Design on Vimeo. Interactions with technology depend heavily on what we can see, hear, say, touch, learn, and remember. Mobile technologies can make situational limitations highly relevant to many people today. Mobile puts in focus questions like: Are we forced to adapt to technology, or is technology adapting to us? 2. Disability happens at the points of interaction between a person and society. Physical, cognitive, and social exclusion is the result of mismatched interactions. As designers, it’s our responsibility to know how our designs affect these interactions and create mismatches. Points of exclusion help us generate new ideas and inclusive designs. They highlight opportunities to create solutions with utility and elegance for many people. 3. Sometimes exclusion is temporary or situational. Even a short-term injury or context affects the way people interact with the world around them, if only for a short time. Think about trying to order a drink at a noisy bar, using your cell phone in direct sunlight, trying to write with a broken arm, or ordering dinner in a foreign country. As people move through different environments, their abilities can also change dramatically. In a loud crowd, they can’t hear well. In a car, they’re visually impaired. New parents spend much of their day doing tasks one-handed. An overwhelming day can cause sensory overload. What’s possible, safe, and appropriate is constantly changing. Understand urgency and medium: Can you be more mindful of the relative importance, and design appropriate levels of urgency? If everything looks urgent, nothing is. Adapt to the customer’s behavior: If a customer consistently interacts with one type of notification, and ignores another, can your system react and adapt? Adapt to context: Does your experience change if the sun’s out, or if there’s a crowded room? An isolated environment? Time of day? Can it respect and change in different types of environments or customer contexts? Enable the customer to adapt: Can the customer personalize the experience, so it works better for their particular needs? Reduce mental cost: How can you make your experiences simpler, clearer, and less costly to understand? Are there parts of the journey that are unnecessary or overly complicated? I’d like to thank Microsoft for their ongoing efforts to make it easier for people to use their technologies, and for taking a step forward in trying to build Calm Technology for the future of our attention! You can read more about Microsoft’s Inclusivity efforts from Doug Kim. If you want to start designing smarter, more empathetic systems, download the booklet for more questions to guide your thinking. Check out the Microsoft Inclusive Design site for more resources, toolkits and ideas. 2017 was a long and unpredictable year. It started with the death of my father, a hero of mine and an electronics and audio pioneer. He was only 56, and it will be difficult to move on without his voice. He started his decline in mid-2016, followed by many hurried visits last year between trips. I’m glad I got to spend so much time with him before he left this planet. This year was enormous for Calm Technology. I was on tour for more time than expected. The 100,000 miles I traveled led me to new places, people and ideas, and I’m excited to explore more of them in the next year. This year’s Calm Technology Book Tour: 103,281 miles travelled! I continue to be an affiliate at the Berkman Klein Center for Internet & Society, and a fellow at MIT Media Lab’s Center for Civic Media. I look forward to returning to Boston this January to participate more fully in efforts around AI, ethics, IoT and calm design. An enormous audience for Mind the Product London! 1. Write more. Write one short essay a month on topics related to AI, ethics, IoT and Calm Tech. 2. Release Designing Products with Sound. I’m working with my editor to improve my writing skills, and I’m making incremental progress. My second O’Reilly book, Designing Products with Sound will come out by the end of 2018, and I’m looking forward to that. 3. Prepare to write a trade paperback. I’ve had many requests for a trade paperback book that provides a wider look at how technology is affecting culture. Audience at Beaverton High School in Oregon. Getting my cousins hooked on synthesizers and sound-making apps during a family visit in August. 4. Visit family more often. Family is incredibly important. I feel that a lot of my life after college was spend in survival mode after graduating in the recession. This year I plan on spending more time with my cousins, my Aunts and my dad’s brother. My family is fairly small, and every moment counts. My favorite book this year was Colour: Travels Through the Paintbox by Victoria Finlay. It followed the author through the origins of many different colors, and I encourage anyone from any background to take a look at it. My second favorite was Writing Tools, a book I’m still working through. Researcher Divine Maloney and I this summer in Portland, Oregon before he left to pursue a PhD in HCI! 6. Finish a research paper on the phenomenology of AR and VR. I’ve been a big fan of VR for some time. I’ve been researching the history of it as a hobby for the last 8 years. I worked on this paper with Divine Maloney this summer and am looking forward to publishing it by the end of next year! Divine and I with the 2017 Harvard Berkman Klein Center Summer Interns in Cambridge, MA. 7. Participate more in the local community and help others. Although I was fearful to do it, one thing I’ve done this year is to sign up as a Blood Marrow Donor at Be the Match. The process is not as difficult as one would expect, and you’d be seriously saving someone’s life if you are a match. All you need is a cheek swab from a kit provided in the mail, and then you wait for a call. Sign up to be a Blood Marrow Donor! Squicky about needles? Consider that matches are rare. Every donor has around a 1 in 500 chance of matching with someone in the US. And “only thirty percent of donations involve actual bone marrow. (The ones that do are mostly for children, who seem to do better with traditional bone marrow transplantation.) Seventy percent of the time, being a “bone marrow donor” is only a tad more complicated than donating blood.” Most of the time, the process can be completed in three hours. If you want to learn more about the process, there’s some good information here: https://io9.gizmodo.com/bone-marrow-donation-is-nothing-like-i-thought-it-was-1676114500 There’s also a neat (and tear-inducing) Radiolab episode about this you can listen to right now! I’m definitely fearful to do this, but if I end up being a match, then I’m willing to deal with a tiny bit of pain to help someone else out. I’d like to thank everyone for their support and comfort during this difficult year. I couldn’t have done it without you. Many of you were proactive in helping me reorganize and help with my family. My family is small and I cherish everyone in it. Thanks also to new friends and faces, art groups and music, and all of the creative things that help to balance out the seriousness. These are crucial and necessary, and we’ll need more of them as we head into the information age. Vice Media crew filmed part of a new show with me at Xhurch in Portland, Oregon. What are your goals for 2018? Best of luck to everyone in this new year! A glacier climb during an AI retreat in Norway this September.